The first Asian American woman, the first woman veteran, the first disabled woman representative in the United States Congress and one of the first American women to go into combat. 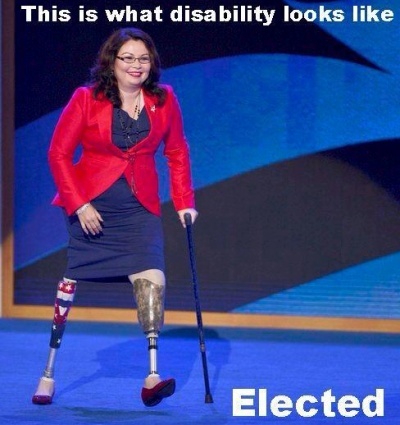 An officer in the American military, a highly trained helicopter pilot, an advocate for veteran’s affairs, and now the newly elected representative for Chicago’s 8th District in the U.S. Congress – Tammy Duckworth is a true heroine. She is also the first Congressperson to be born in Thailand. Born in Bangkok to a Thai-Chinese mother and an American soldier father, Tammy is multi-lingual in Thai, Indonesian, and English, in addition to her many other talents. As a child, her family moved around Southeast Asia for her father’s work with the U.N. and she attended international schools in Singapore and Bangkok among others before the family settled in Hawai’i when she was sixteen. Her Wikipedia biography details a life of courage and commitment. She graduated from the University of Hawaii in 1989 with a Bachelor of Arts in political science, and received a Master of Arts in international affairs from George Washington University. She joined the National Guard while in graduate school and eventually became a Captain. She was working on a Ph.D. in political science at Northern Illinois University on the political economy and public health in Southeast Asia when she was deployed to Iraq in 2004. In one of life’s strange ironies, in 2003, she worked as a staff supervisor for Rotary International, tasked to provide wheelchairs for the disabled in developing countries including Iraq. As a Captain in the National Guard, she trained to become a helicopter pilot as it was one of the few positions in which women were allowed to go into combat. She was mobilized for ‘Operation Iraqi Freedom’ the following year – and that’s where she became disabled herself. November is Tammy’s month. Many crucial events in her life seem to occur in November — including this year, her election on November 6th. But she picked herself back up and went on to become Director of the Illinois Department of Veterans Affairs on November 21, 2006. She is credited with many national firsts on behalf of disabled veterans including programs to deal with Post Traumatic Stress, improve traumatic brain injury screening and reduce homelessness among veterans. 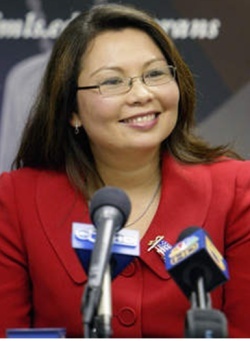 In 2009, Duckworth was nominated by President Obama to be the Assistant Secretary of Public and Intergovernmental Affairs for the United States Department of Veterans Affairs. She resigned the position in June 2011 to launch her second campaign for Congress – with President Obama’s support. It’s the day she gets together each year with her fellow soldiers who were with her on the Black Hawk helicopter she was piloting when it was hit by a rocket-propelled grenade. The RPG destroyed her legs. Thirteen months later, she had been fitted with titanium legs and is now fully mobile. This is the twentieth part of our series where we take a look at all the 22 ingredients in Paul Penders’ patent pending LevensESSENTIE Gold® herbal extract which is a part of all Paul Penders products. St. John’s Wort (Hypericum perforatum) is one of nature’s outstanding herbs. It possesses anti-oxidant properties, but is mostly used in cosmetics to tone, strengthen and heal skin. The herb can be recognized by translucent dots on its leaves (see picture below) and, when it blossoms between late spring and early to mid summer, by its yellow flower petal with five flowers in it. Originally, St. John’s Wort was native to Europe, but early colonists brought it to North America. The herb can now be found in temperate areas in the Eastern United States and California, in Australia and New Zealand, in Eastern Asia, and in South America. St. John’s Wort has been known for its medicinal properties as far back as in the Roman times – 2,000 years ago. On the battlefield, it was a much used remedy that promoted healing from trauma and inflammation, as well as it quickened the healing of wounds, bruises, ulcers, and burns. In Germany, St. John’s Wort it is licensed and used as a mild anti-depressant, and sold from pharmacies, mostly as capsules (300-500 mg). Scientifically, this effect seems to have been confirmed, predominantly in German studies. The herb has a calming effect, is good in easing tensions and anxiety, and also used to soothe women’s mood swings during menopause. In Germany, it is as well licensed as a treatment for anxiety and sleeplessness. A warning might be on its place here. 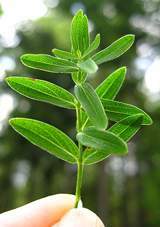 If you consider using St. John’s Wort medicinally in the above mentioned dosage (300-500 mg), please contact your medical doctor first, since an oral intake of this size can influence on, and affect the use of other medicines. 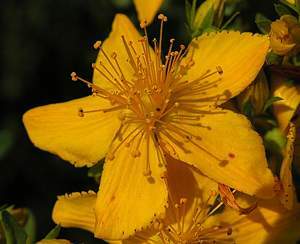 In cosmetics, St. John’s Wort is perfectly safe to use, since the quantity of the herb used here is only a fraction, compared to when the herb is being used medicinal as mentioned above. St. John’s Wort is not used in traditional cooking, because of its very bitter taste. In Paul Penders LevensESSENTIE Gold® herbal extract, though, organically grown St. John’s Wort is a highly valued ingredient, due to its skin strengthening effect, and, most of all, its healing abilities – not to forget its calming effect on “a stressed” skin. If it hadn’t been for a group of nuns, the Paul Penders company might not be here today. Paul Penders shares a wonderful story in his autobiography. Can you imagine being a man in a nunnery? A little backstory first. Like many governments in Europe in the 1970’s and 1980’s, Paul’s home country of the Netherlands (Holland) instituted testing of cosmetics – on animals. When Paul brought in his shampoo formula for testing, he witnessed the horrific practice on a day that changed his life. He ran out of the laboratory determined to find a better way. As it happened, he had two aunts who were nuns. “Feeling rather down after the debacle at the animal testing labs, I received a call from my aunt soon after. A family member had spoken to her about my issues with the Dutch FDA and she called to offer support. My Aunt Bertha or “Sister Bertha” as she was known within the order was a real character. She was an accomplished artist and sculptor in her own right and believed in standing up for the underdog. 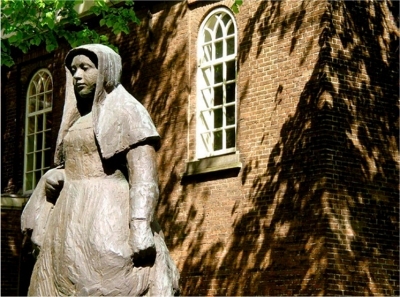 She spent plenty of time in Amsterdam befriending prostitutes as she felt that their spiritual needs shouldn’t be neglected because of their profession. My aunt was a nun who lived with her sister (my other aunt and another nun!) in the convent in Baarle-Nassau; she had spoken to her colleagues about me and convinced the rest of the sisters that they needed to help the lab animals by testing my products on themselves! I was so touched that my aunt had galvanized her convent to my cause and I hoped that my so-called ‘nun testing’ would be approved by the Dutch FDA. to ‘people test’ his shampoo formulas on nuns. For the next eight months I visited the Convent every week to participate in a solemn ritual. On my first visit to the Convent I was rather startled by the sight of the large group of nuns silently waiting for me. I thought that they looked like a bunch of penguins huddled in the corner. I felt very privileged to be allowed into their cloistered world. Paul’s decision not to test his skincare on animals created a major controversy in Holland, the country of his birth. Despite this long-term, successful experiment, the products were never officially approved — largely due to pressure exerted by powerful enemies from within both the Dutch bureaucracy and large cosmetic companies. 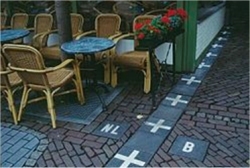 The Dutch FDA delivered Paul an ultimatum: test your products on animals or close down the factory. His morals left him with only one choice: the search was now on for a more enlightened host nation. To his great joy, Paul found that the American FDA was open to his idea of non-animal tested cosmetics — so the company moved to America. Over time, animal testing of cosmetics became a mainstream issue, eventually influencing every major company. The Paul Penders company became world renowned for its courageous stance. Ironically, it was Holland that became the first country to comprehensively ban animal testing of cosmetics. 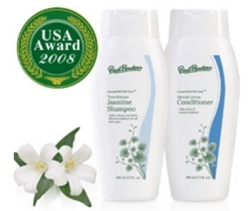 And it is thanks to Paul’s aunts and the nuns of Barle-Nassau that you can be certain that Paul Penders shampoos and organic herbal cosmetic formulas, featuring the special herbal concoction LevensEssentie created by his grandmother, are among the very best in the world. Read the fascinating story of Paul’s life and career as an e-book, Pushing the Boundaries: The Paul Penders Story. By Paul Penders with Teviot Fairservis. Paul Penders senior cosmetic chemist moves throughout the laboratory with a twinkle in his eye. As he reaches for bottles and measures out quantities, you sense he knows exactly what properties the ingredients will give to a formula. 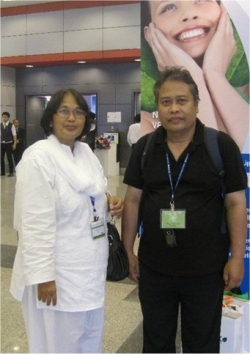 He attended the famous Gajah Mada University in Jogjakarta and earned his doctorate from the prestigious Airlangga University in Surabaya, Indonesia. His particular specialty is tropical flowers. Paul tells me, “You can ask Dr. Gatot anything about flowers.” A glance at any box in the product line reflects his expertise – angelica, arnica, calendula, chamomile, ginger, lavender, rosemary and many other flower oils and herbal extracts are carefully blended in exact proportions into creams, lotions, shampoos, and more. Dr. Gatot and Paul Penders are both excited. Paul has returned from the Malaysian mountains of Perak where he wandered high into the jungle to an indigenous village. He has brought back with him samples of the tropical “senduduk” white flowers, a special mineral clay collected from a sacred stream and bottles of the waterfall water. They have had these rare elements tested by internationally accredited laboratories and it turns out they contain minerals like potassium and manganese that are healthy for the body. The mountain stream water is so pure, you can drink it. Now they get to play. The real fun for the cosmetic chemist seems to be in the formulation of something new. Paul Penders has worked with Dr. Gatot for years and the trust and understanding they have with each other is evident as they brainstorm new formulas. It is fascinating to watch these two men as they suggest ingredients for new cosmetics. Not every day in the lab is as exciting as when making new products. 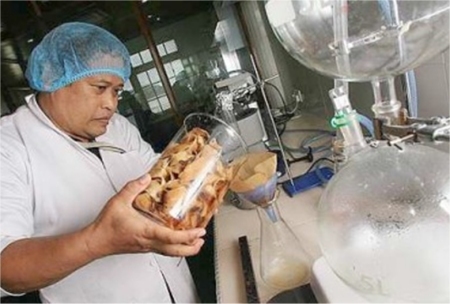 Because Paul Penders products are cold blended and made in small batches, Dr. Gatot must supervise and check that staff prepare formulas to his exacting requirements. “And you thought making shampoo was easy,” says Paul. As I watch, Dr. Gatot stirs the shampoo on a machine with magnets. Before my eyes, it becomes thick and creamy, and changes from a clear liquid to the color of fatty milk (the kind we no longer drink). He holds out a small bowl for me to smell. The scent is sweet, even deep, with many notes of cinnamon and sugar. “Earthy,” Paul calls it. Dr. Gatot writes down the exact proportions and grams of each ingredient. “This is expensive shampoo! The most expensive I’ve ever made,” laughs Dr. Gatot. And I answer, “I’m just amazed!” The new shampoo that Dr. Gatot has just created is a big commitment – this formula will be replicated thousands of times. That formula needs to be perfect. Tonight we will all be given samples to take back to our rooms – tomorrow we’ll each report on how the shampoo feels and works on our hair and skin. Volunteer testing! admire who have been featured in the PP Blog. Please click on the links to read the full story! Corporate Social Responsibility (CSR) is serious business but it can be fun! This October, PP gifted our community with the first classical music concert ever held on our Langkawi island home. 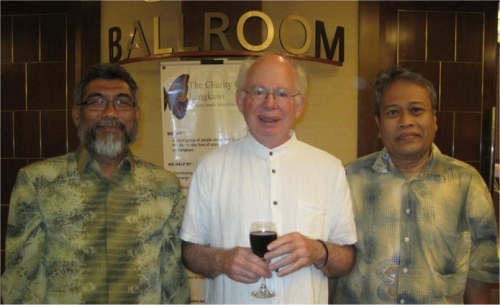 And there’s more to come with the Langkawi Chamber Music Festival in 2014! Paul Penders can proudly claim to be among the very first in the world to stand up to a government and refuse to allow his products to be tested on animals. As long-time supporters of PETA, we are outraged by their recent actions. What’s going on here? Is PETA right to ban companies that sell products in China? Should the famous animal rights group condemn a company just because its products are sold in China? Will that change any hearts or minds? Or will there be a backlash? Did you know that many products that you apply to your body contain plastic? New warnings are out about the health risks of a mysterious substance called “phthalates” found in plastics. Citrus yellows were on display at this year’s Emmy Awards, paired with a wide palette of lipstick colors. Lipsticks speak: Do you want to say ‘I’m subtle and demure’ or ‘look at me!’? De-stress. Give yourself a Scalp Massage! Trichology – the scientific study of the hair and scalp. Your scalp is made up of five layers that medical students learn with the mnemonic ‘S C A L P’. A scalp massage benefits your hair – and can help de-stress your whole body! We heard from our friend “Down Under.” She’s got a lively online store, a Facebook Page, and great plans to reach out to new customers.